Jesse and I have been working non-stop on his Kickstarter campaign for American Psycho the musical. Needless to say we’ve been living and breathing all things Patrick Bateman for the past few weeks so when we thought of making a baby morning routine for Mother’s Day, we really couldn’t resist. I have a feeling we’ll be out a lot of money for Dec’s therapy sessions someday… Hope you enjoy! 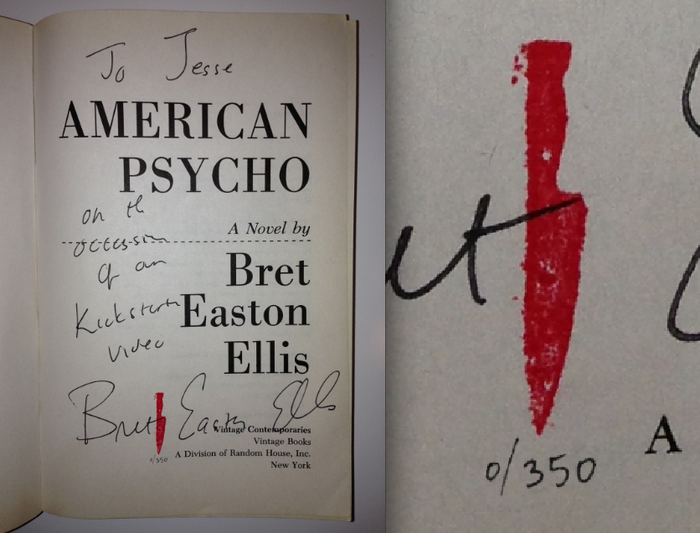 This signed copy of American Psycho is just one of the very cool rewards on the AP kickstarter page. If you are still reading this and have not visited Jesse’s page (did I mention it was American Psycho on Kickstarter?) I’m thinking you are a robot whose programmer forgot to write code for basic knowledge of pop culture combined with the human emotion called curiosity.